I know I just gave a state record update last week, https://barbsandbacklashes.wordpress.com/2010/06/10/record-fish-june-10-2010/ , and I could wait until I had at least a couple or three new applications before I did another update. But I cannot wait, THIS IS HUGE! HOLY COW! I told you it was huge! 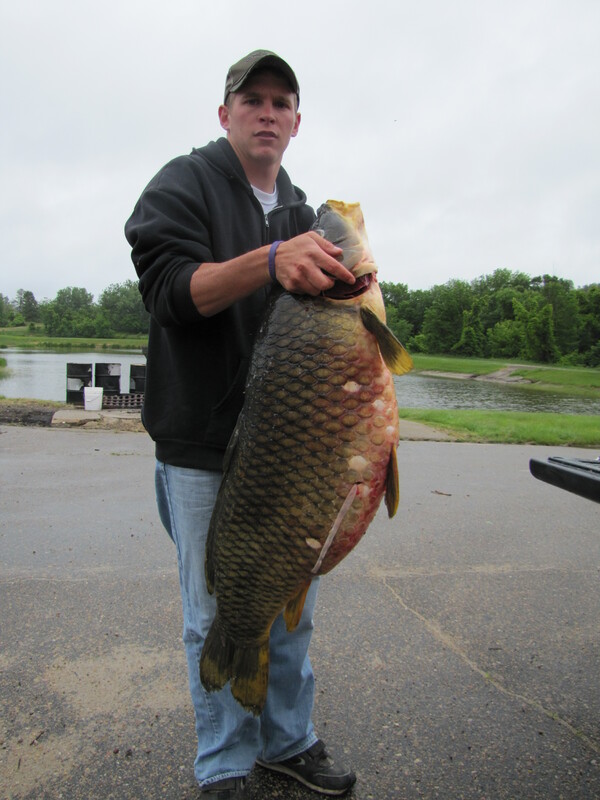 This common carp was taken last Sunday, June 13, 2010, by Alex Peterson from Burwell. That carp was 40 inches long and weighed 50 pounds 5 ounces!!!!! The fish was taken by bow & arrow from Dewey Lake on the Valentine National Wildlife Refuge. Congratulations Alex; I do not know how you could hit such a small target. Ha. The scales on that thing are bigger than some fish I have caught! Let me put a little perspective on a 50-lb.+ carp. The National Fresh Water Fishing Hall of Fame, http://www.freshwater-fishing.org/ only keeps world records for fish taken by hook & line, but looking through their line class records I only see two carp records in excess of 50 pounds! The all-tackle world’s record common carp recognized by “The Hall” is a 57 pound 13 ounce fish. So, a 50-pound common carp is a WORLD CLASS common carp! That sets our bow-fishing state record for common carp really high! Wow, that thing is gargantuan! I completely am in awe of this blog .totally gonna have to put this on my bookmarks.